The UltraLav ADA series is specifically designed to accommodate the unique needs of disabled users. 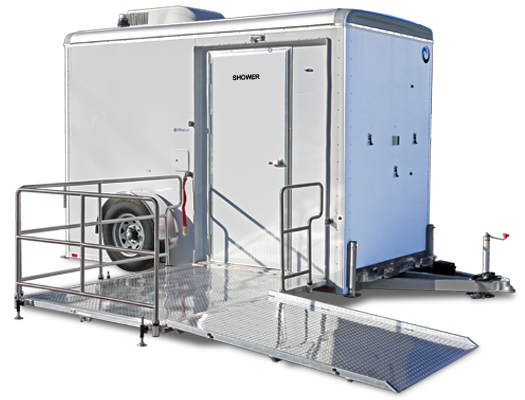 The UltraLav Single Shower ADA is an ADA accesible shower trailer, but it is NOT certified ADA compliant. Everything you need to set-up, including the railing/ramp assembly, are totally self-contained. No need for separate storage units or another tow vehicle. This amazing engineering feat is accomplished by our exclusive and proprietary “one-touch” hydraulic trailer lowering system. The entire trailer smoothly and quietly lowers to the ground making long and cumbersome ramps obsolete.